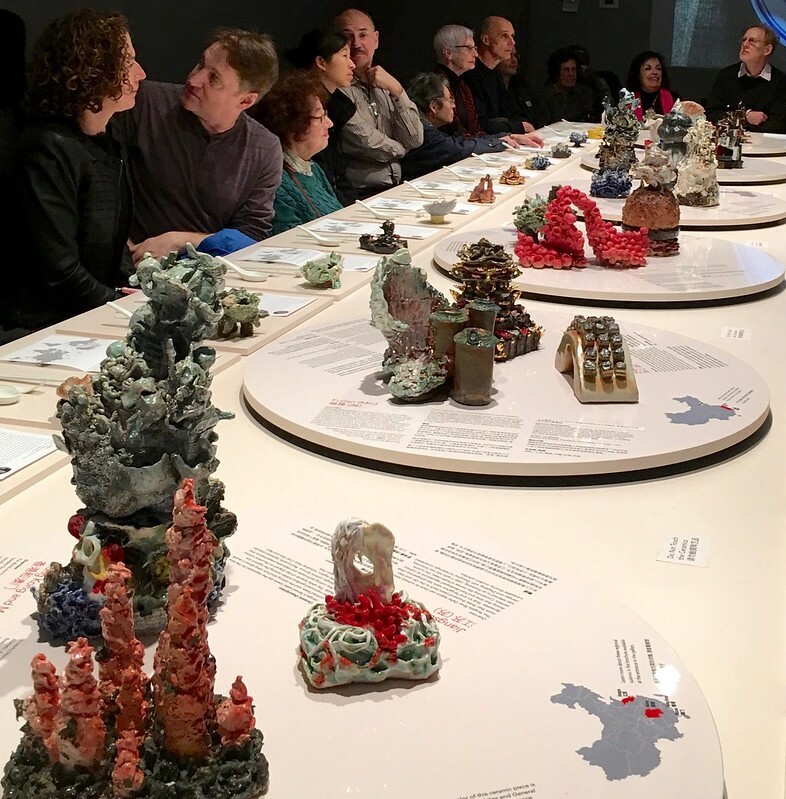 Attendees seated at MoCA’s Chinese-American table, as interpreted by ceramic artists Heidi Lau and Lu Zhang, before the start of the program. Noted culinary historian Anne Mendelson sat down for a chat with International Association of Culinary Professionals award-winning cookbook author, Kian Lam Kho, on December 7 to discuss Chinese food in America: how it started in the mid-19th century, the changes that were required to make food palatable to a xenophobic white audience, and the difficulties of interpreting a radically different Asian cuisine to 20th century cooks schooled in European culinary language. Much of the evening centered on the changes in Chinese cookery in the U.S. after the immigration reforms of the 1965 Hart-Celler Act and the opening of relations with China by Richard Nixon in 1972. The first wave in immigration came from Nanyang–the “Southern Ocean”– the area of Southeast Asia where a Chinese diaspora had already started, with ethnic Han living in Vietnam and other Southeast Asian nations, where the Chinese were despised. Mendelson pointed to the racial discrimination they faced as “the Jews of Asia,” making the decision to come to the U.S., especially after the fall of Saigon, an easy one. They brought Hunanese and Sichuan cooking with them, leading restaurant reviewers such as the NY Times’s Ray Sokolov, to swoon over the chilies that danced on his tongue at fancy midtown places such as Hunam. Nowadays, with Fujianese and many other regional and subregional groups entering the U.S. and having the relative luxury of living in enclaves, a greater range of mainland culinary styles can be found, as these immigrants can prepare dishes to please their palates, rather than struggling to adjust their cooking to please a white audience. Whether this food should be considered “authentic,” however, raised some hackles: Kho observed that foods are always changing, with Mendelson nodding in agreement; the best that can be said is that these foods represent culinary traditions. Even traditions are subject to change and interpretation: the chilies that are so closely identified with Sichuan cuisine were introduced to China by the Portuguese in the 16th century: these new ingredients melded with the pre-existing heat, called ma, found in the cuisine through fagara, aka Sichuan pepper; chilies (la) were incorporated in dishes using centuries-old culinary techniques. The resulting combination is the distinctive ma la taste of Sichuan cuisine. One of the best ways for the mid-century Anglophone to learn about Chinese food was through Buwei Yang Chao’s “How to Cook and Eat in Chinese” (1945), a book that introduced Americans to terms like pot stickers and stir-fry, demystifying much of the alien Chinese culinary technique. Another milestone was the Time-Life “Food of the World” series, with is ample illustrations. Most recently, Lam Kho’s “Phoenix Claws and Jade Trees” (2015), is a techniques-driven cookbook designed to update Chinese techniques for Anglophones. Members of CHNY used the book to create luscious snacks for the reception preceding the talk: his Shrimp Salad from Guangdong is our featured recipe. Both Mendelson and Kho are optimistic about the state of Chinese food in the West, noting that sophisticated cuisines from different regions of China can be found in wealthy areas serving emigrant communities. Venture to Toronto or Vancouver for sophisticated Cantonese fare; Kho opines that quality Cantonese cooking is China’s finest, subtlest cuisine. Closer to home, Kho recommends newcomer Madame Zhu’s Kitchen on 6th Avenue for creative, modern Chinese.